Part of the fun of being a Travel Hag is traveling with girlfriends. 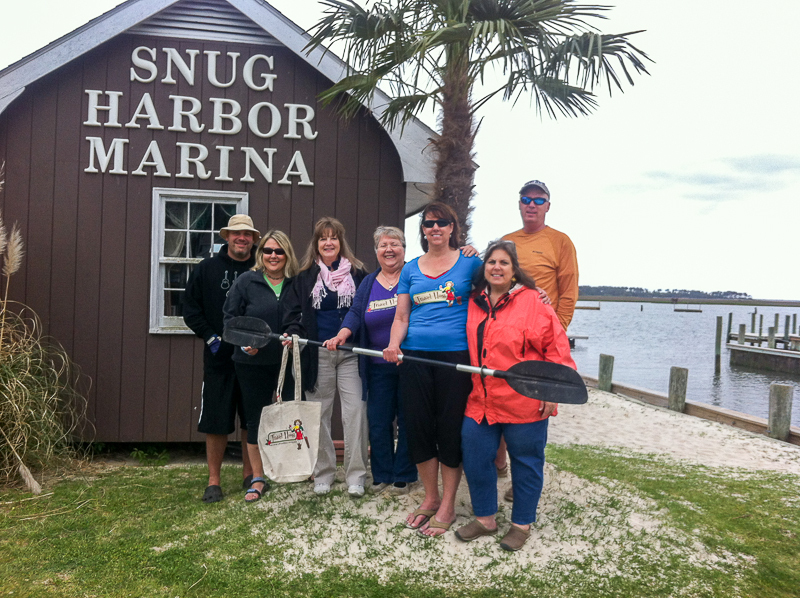 On May 18, 2013, four Hags met at Snug Harbor Marina on Chincoteague Island (2 brought their husbands) and launched kayaks for a four mile paddle out to Assateague Island in the rain. Actually 5 hags met, but one (Sandy) chickened out because she thought the damp weather would irritate her arthritis. Sandy is 70 and is a competent paddler. So I’ve named the hags and two of the hot men (who belonged to two of the hags). The other Hotties were the guys at Snug Harbor Marina who helped us launch. 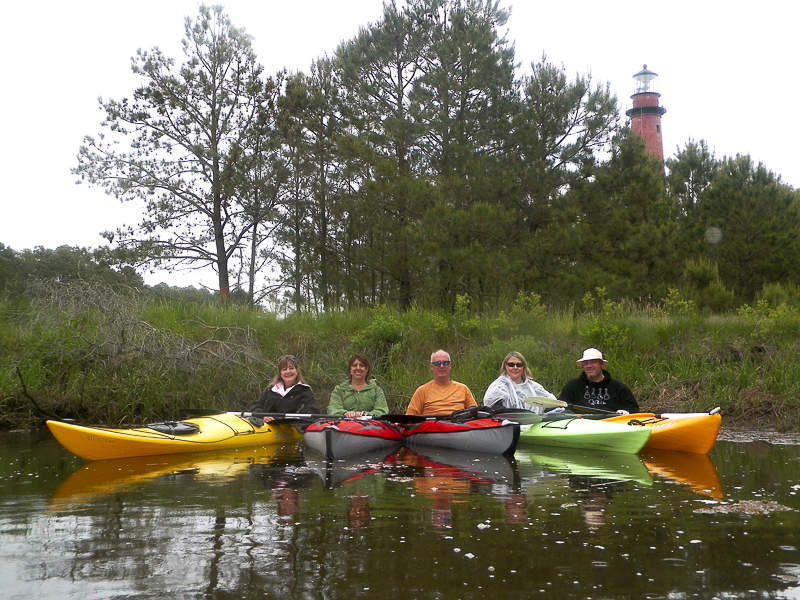 From my first call to Snug Harbor to inquire about kayak rentals and help with this group Adventure, it was easy going. They were accommodating letting some of us (most of us) bring our own kayaks while others leased from them. They helped all of us launch, unload from the car tops and answered questions. AND they were adorable. (see video). From Snug Harbor it’s an easy paddle across Chincoteague Bay and there are several trails that cut into Assateague Island that allow a calmer, more flat water paddle. The Assateague Island lighthouse is visible on the horizon and usually the wild ponies will be in view somewhere along the way. On our trip, the weather was horrid, so the ponies must have sought shelter. Even in the rain, it was a beautiful paddle. Everyone brought their lunch and we had a picnic under the overpass going onto Assateague Island. For all the paddling pics of this trip – from the launch at Snug Harbor to the return – see the 2:30 video below. Chincoteague is an island on the Eastern Shore of Virginia and was voted #1 Best Beach Town in America when AOL Travel named the Top 10 in 2010. Chincoteague has an adorable downtown with a movie theater, restaurants, shops, galleries and waterviews at nearly every turn. The island is surrounded by a salt marsh, abundant with waterfowl, sea grasses and wildlife. Just across the causeway is Assateague National Seashore with some of the most gorgeous, sandy beaches found on the Atlantic Coast, in a private, non-commercial setting. And then … there’s the charm of the wild ponies – horses whose ancestors were brought to America from the colonies. 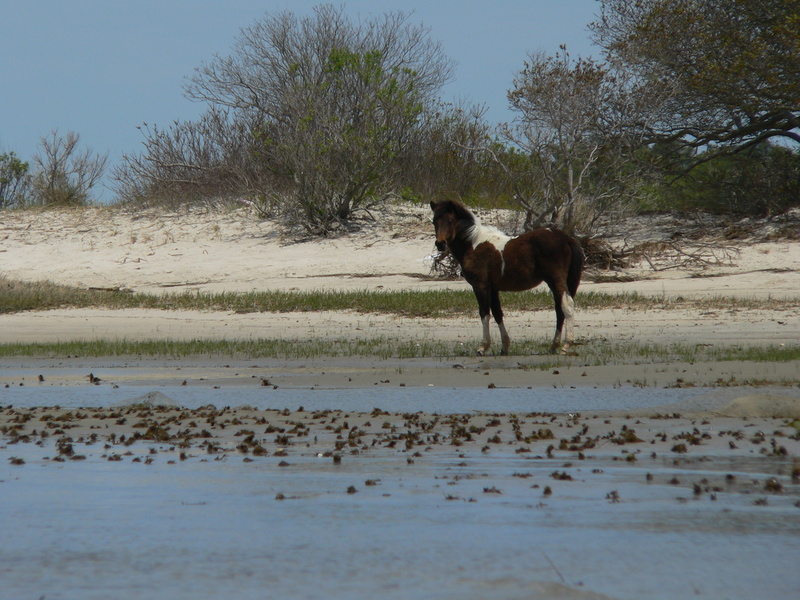 They’ve been on the island for over 300 years and they run wild in the forests, marshes and beaches on Assateague. Both Chincoteague and the Assateague Island ponies were made famous by the children’s classic, Misty of Chincoteague about the wildest mare on Assateague Island who get’s purchased at the auction during “Pony Penning” and gives the owners a run for their money. After the paddle, the Travel Hags headed into Chincoteague’s historic downtown. The folks at Snug Harbor recommended Bill’s Seafood Restaurant on Main Street. 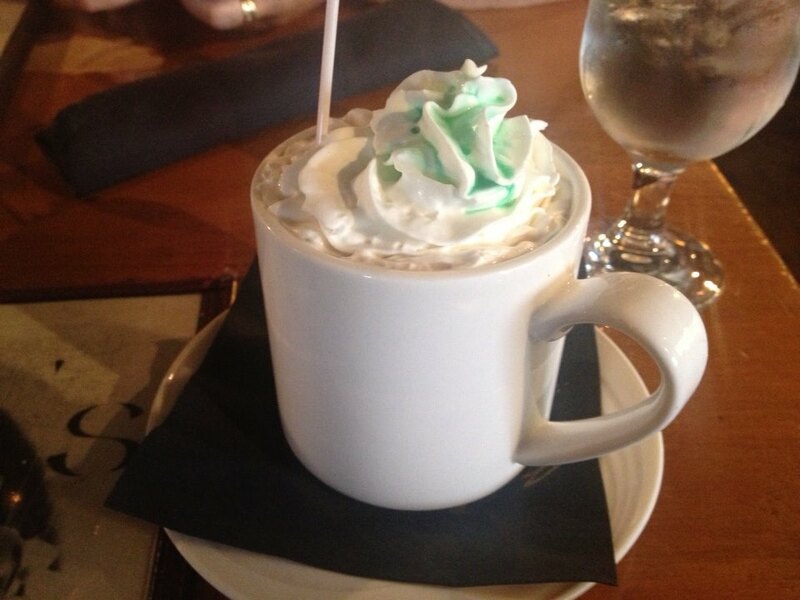 Since we’d been out in the chilly, rainy weather for several hours paddling (and some of us were soaked), the first Travel Hag to order asked for an Irish Coffee. Wow. I wasn’t thinking about drinking — but what a great idea is was to have just a tad of whiskey and coffee, topped with cream, with a dash of mint on top (green effect). It warmed up my cold self. – Irish Coffee pic here. If you haven’t eaten Chincoteague Oysters, they are a must to try while you’re in town. Eating oysters in Chincoteague is like eating lobsters in Maine or eating steak in Texas. They are famous for their salty taste that comes from being harvested so close to the Atlantic Ocean. A Dorchester County, MD watermen told me that the dredge up all their oysters ready for harvest from the beds in the central Chesapeake Bay region, and ferry them down to Coastal Bays (like Chincoteague Bay) and drop them there for a week or two just to pick up that salty taste. But the oysters that got their start in these salty bays are like no Chesapeake oyster I’ve ever eaten. The are worth traveling to Chincoteague for – at least once in your life. I had the best oyster stew EVER at Bill’s and our Travel Hag from Salisbury, Lisa – had Oysters Rockefeller and snapped the photo above. 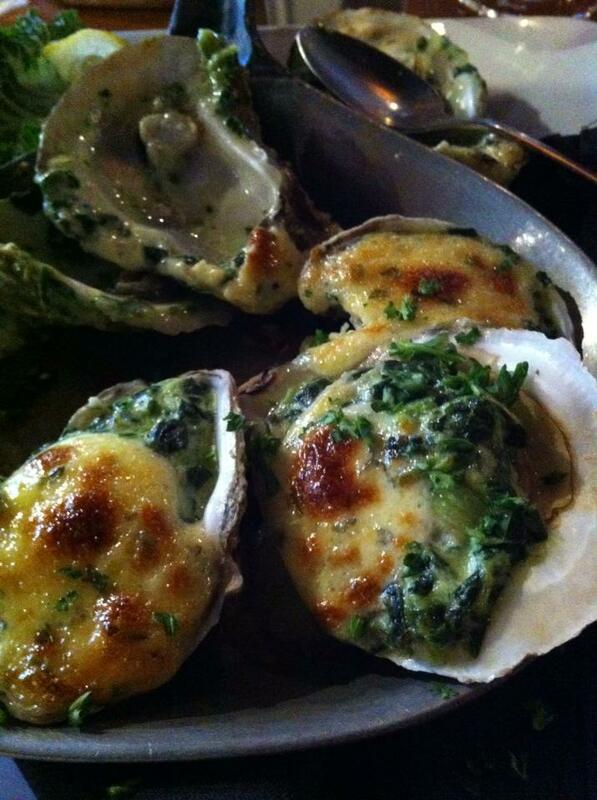 At first I hesitated ordering the oysters – being that it was May (never order oysters in a month without an R). But the server at Bill’s said the old adage no longer applies since refrigeration has become so efficient. A little further reading revealed that the concept dates back to a warning Mid-Atlantic Indian tribes gave to settlers in the Chesapeake region and the settlers created the handy “month without an R” linkage for easy remembering. A health and fitness writer explained this concept more scientifically in the New York Times back in 2008. There’s something indescribable about traveling to a region historically known for harvesting oysters, and having a meal of local food prepared and served by local people. The people know the lore, but they don’t even realize that they’re living it – because they are an extension of it. The locals ARE what give authenticity to Chincoteague as a historic that has retained its culture and managed the millions of tourist that have traveled there over the years. Eating oysters at Bill’s, getting out on the Chincoteague Bay paddling between both islands, seeing the oyster and clam shell mounds covering the shoreline, passing by the famous Assateague lighthouse that began guiding sailors away from shoals back in 1833, and is still used as a navigational aid today, and wandering through the historic downtown that shows a rare combination of island folk who work on the water and tourists who love the landscape and lore —- ALL of these elements make Chincoteague a travel experience worth having. Island Creamery – homemade ice cream, lattes and fun coffees <– we went here for dessert. Fabulous.